A new Postcrossing stamp... from Ireland! We have good news coming from the North Atlantic today: An Post is getting ready to release a lovely new Postcrossing stamp tomorrow, on October 5th! Irish artist Cathy Dineen did the illustration for Design HQ, who created the stamp. It features postcards being passed from person to person. Have a look: Isn’t it just gorgeous?  Cathy did a wonderful job of capturing the connections that the project sparks as well as its diversity on this small format. 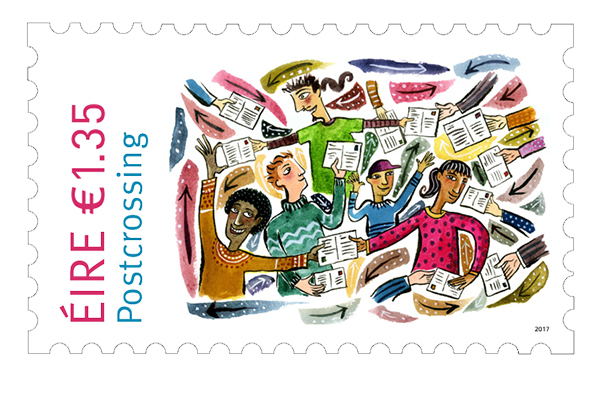 And the launch is just days before World Post Day takes place, which is a nice bonus too. The stamps will be available throughout the country and on An Post’s online shop… but if you’re in Ireland or can make it to Dublin in the weekend, there will be a large meetup on October 7th! Attendees will be able to visit the General Post Office’s museum and check out the Witnessing History exhibition too. More details can be found on this forum thread. Hurray for beautiful stamps that honour Postcrossing and its community! 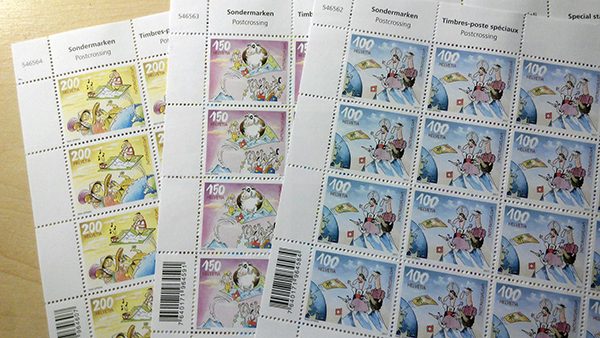 New Postcrossing stamps... from Switzerland! 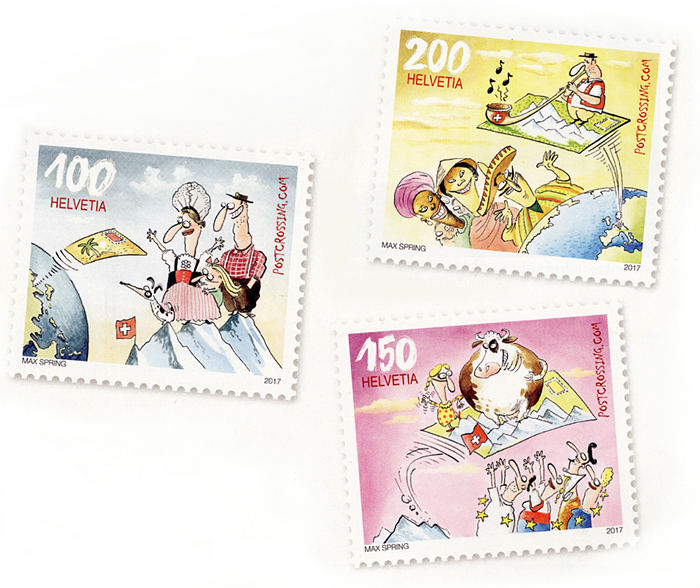 Can you guess which stamp should be used on a postcard sent to Switzerland, Europe or the rest of the world? 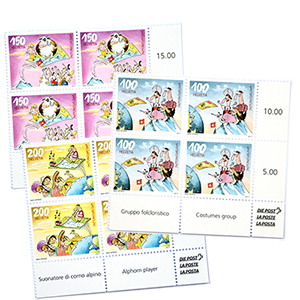 The trio of fun stamps was drawn by cartoonist Max Spring, whose style will be familiar to many as his illustrations often appear in newspapers, stamps and other publications. He did a wonderful job on these, and we’re sure they’ll be a highlight on any postcard traveling from Switzerland! Poll results: Licked or self-adhesive stamps? Many of you might not remember we used to have polls on the site, a looooong time ago. The last time we ran a poll on Postcrossing was back in 2011… and we seem to have forgotten all about them. Paulo stumbled on the code for polls recently and was pleasantly surprised to discover that it still works! 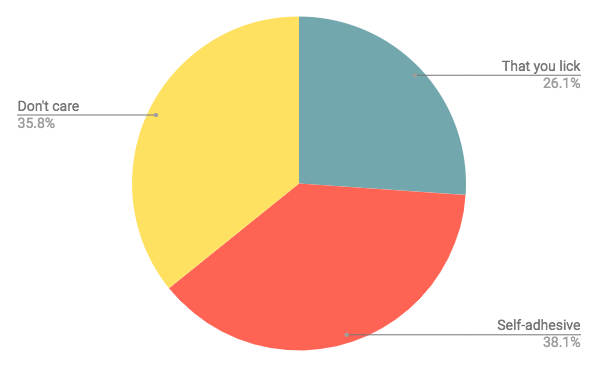 So we decided to run a poll about something that has been intriguing us for a while: people’s preferences on the stamp types and how they adhere to postcards. Are self-adhesive stamps (that you peel off a sheet) better than stamps on gummed paper (that you lick)? Does it even matter? But first, a bit of postal history: can you name the first stamp ever made? And who was its creator? If your answer was Penny Black and Sir Rowland Hill, you’d be correct on all counts! In its 1837 pamphlet, Sir Rowland Hill called for “low and uniform rates” according to weight (rather than distance) and proposed the concept of stamps: a piece of paper “covered at the back with a glutinous wash”. The first gums were called cement and consisted of a mixture of potato starch, wheat starch and acacia gum. The idea “stuck”, and quickly spread from the UK to the rest of the world. In 1964, 124 years after the release of the Penny Black, the first self-adhesive stamp was created by an unlikely country… Sierra Leone! That’s right — this African nation was the first one to give it a try, followed by a Christmas stamp from the USA ten years later… and many other countries after that. If you’re curious to learn more about these themes, check out the Wikipedia page for Postage Stamp gum. Looks like things are more or less evenly divided! Though a large number of postcrossers doesn’t seem to have a preference, from those that do prefer a type of stamps, the choice of the majority seems to be self-adhesive stamps. That surprised me, as I expected postal lovers to prefer the traditional ones… but I can definitely understand that licking might not be for everyone and adhesive stamps can be more practical. What about you? Which camp are you on, and why? 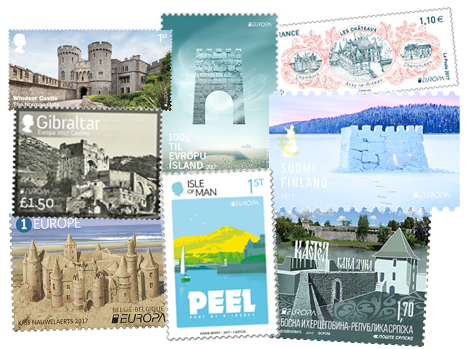 Time to vote for the best EUROPA stamp! Now that Eurovision is behind us, it’s time to vote for another popular European contest… the EUROPA stamps of the year!